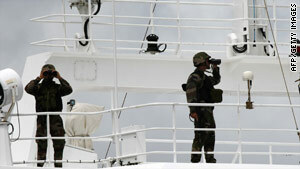 Piracy on the high seas reached a six-year high in 2009, according to the International Maritime Bureau. (CNN) -- Pirates released a Greek oil-tanker more than seven weeks after hijacking it off the coast of Somalia, the European Union Naval Force Somalia said Monday. The M/V Maran Centaurus was commandeered about 600 nautical miles northeast of the Seychelles on November 29, the naval force said in a release. The 28-member crew had been headed to New Orleans, Louisiana, the Maritime Security Center reported earlier. The pirates freed the ship and its crew after being paid ransom, naval force spokesman Cmdr. John Harbor told CNN. He would not disclose the ransom amount, but added that a firefight erupted between the paid pirates and a rival group. The pirates radioed the naval force for help, but "we declined," Harbor said. The ship was released off the coast of Somalia near Haradere and is headed toward Durban under the watch of the naval force, the release said. The crew is comprised of nine Greeks, 16 Filipinos, two Ukrainians and one Romanian. On Saturday, pirates attempted to hijack an Indian crude oil vessel 105 nautical miles from Somalia, the naval force said. The pirates opened fire on the ship and were later arrested. No one on the oil ship was hurt, the force said.